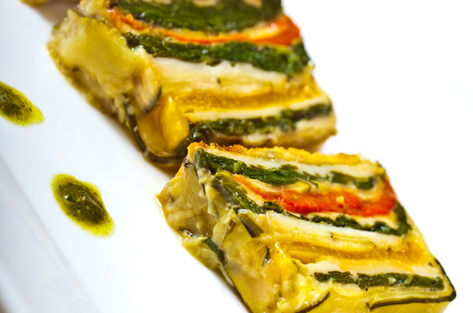 " A hallmark of Italian cooking is its simplicity. 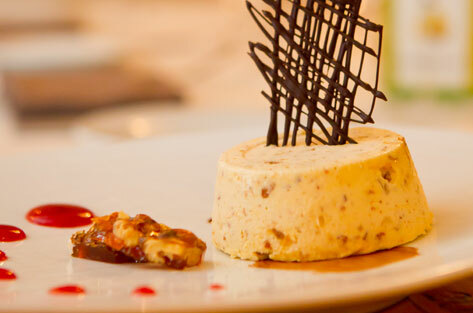 A handful of ingredients thrown together can truly create magic." This shining example of the Mediterranean diet is not only good for you with its omega-3 fatty acids, but its flavors are also very nicely balanced for those who enjoy eating raw fish. This recipe incorporates the same ingredients traditionally used to prepare tuna and swordfish, but here I present them in a more modern and elegant way so that they complement each other to an optimum degree. Personally, this recipe always brings to mind my nephew Giovanni Rocco, who lives in my home region of Basilicata and absolutely loves this crudo. Whenever he takes a trip to Washington, I celebrate his visit by preparing this dish for him. Note that the fish in this recipe should be at the peak of freshness; otherwise you may want to reconsider preparing it this way. Note also that the swordfish must be placed in the freezer for 30 minutes before you start this recipe. Place the tuna cubes, onions, lemon juice, ¼ cup of the extra virgin olive oil, chopped dill, and salt into a medium bowl. Mix well to combine flavors and set aside. With a sharp filleting knife, slice the swordfish across the grain into paper-thin, 1/8-inch slices. Divide the swordfish into 4 equal portions and place on each of 4 plates, making a star formation and leaving the center empty. 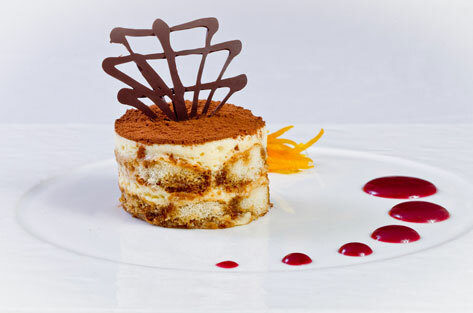 To serve the crudo Al Tiramisu-style, place a mold (2 ½-inch diameter by 1 ½-inch deep) onto the center of each plate. Fill the mold with the tuna mixture and top with the capers and olives. Remove the mold before serving. 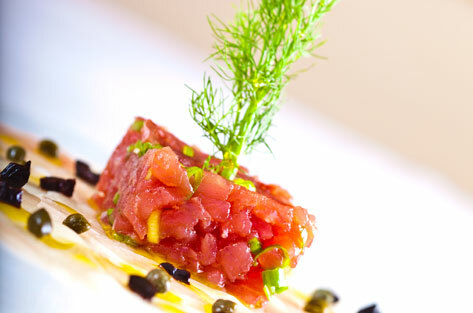 Alternatively, arrange the tuna in the center (without the mold) and top with the capers and olives. Top the swordfish pieces, and/or the tuna mold with the dill sprigs and serve immediately. Tuna and swordfish, which proliferate in the waters that separate mainland Italy from Sicily, have played a prominent role in the diets of the people of Calabria and Sicily ever since ancient times. Eating raw fish is not common today in some parts of Italy, but in others, such as the area around Bari on the Adriatic coast, it’s almost mandatory to eat raw fish on Fridays. *Note that consuming raw or undercooked meats, poultry, seafood, shellfish, or eggs may increase your risk of food-borne illness. copyright luigi diotaiuti 2019. all rights reserved.